Tender Greek Pork looks delicious and this recipe can work for the Instant Pot or slow cooker so everyone can choose the method they prefer! And this Tasty Greek Pork can be served in flatbread, over rice, or to top off a salad, and this can easily be a low-carb meal. And doesn’t everyone love pork with those Greek flavors? This Tender Greek Pork from Mel’s Kitchen Cafe sounds delicious no matter which way you make it. It’s flavorful, fall apart tender, and cooks in about an hour in the Instant Pot. Or if you want to make your house smell great, make Tender Greek Pork in the slow cooker! With the combination of lemon, oregano, and garlic you get an irresistible greek flavor. Add some homemade Tzatziki Sauce to make this recipe even more of a treat! And if you serve inside low-carb pita bread or over salad, Tender Greek Pork can easily be a low-carb dinner; enjoy! 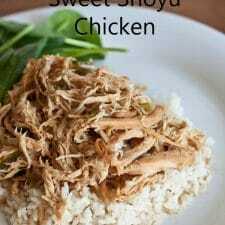 Check out all the slow cooker or pressure cooker Pork Recipes on this site.